Photo used with permission of Dale Niesen. This is the second attempt to post this article to the blog, hopefully I will have better luck this time. I am deeply indebted to Dale Niesen for allowing me to use the image of John Sirrine from his private collection, and to Bob O’Neill for retrieving his pension record from the National Archives to add detail to the post. At the outbreak of the Civil War John and many of his neighbors tried to enlist as volunteers in the Union Army. The local militia company, known as the La Fayette Light Guard, had formed in Van Buren county in 1859, and its ranks soon swelled with volunteers. The problem was that Michigan had already provided her share of the volunteers requested by President Lincoln. Not to be deterred, the company’s officers persisted in their efforts and the company became Company C, 70th New York Volunteer Infantry. John enlisted in the company on April 25, 1861, five days after his cousin Arthur. The company departed for New York City on June 13, 1861, and mustered into federal service on June 30th. It remained on Staten Island until boarding a train for Washington July 23rd, arriving the next day. The regiment encamped on Meridian Heights through the winter, and embarked on ships for the peninsula with the rest of McClellan’s army in April 1862. It lost several men to typhoid fever during the winter, and John was nearly one of them. He was so sick that his brother travelled to Washington to care for him while he was in the hospital. He was offered his discharge, but refused it and was back on his feet in time for the spring campaign. The company was heavily blooded during the spring and summer’s fighting. One hundred twelve men enrolled in the company, including the officers. In its first battle at Williamsburg on May 5, 1862, it lost 8 men killed and 23 wounded and missing. One soldier drowned at Harrison’s Landing, and a few weeks later at Fair Oaks it lost two more men killed and three who would later be discharged due to their wounds. Several more were wounded at Second Bull Run in August and Antietam in September. The company’s losses weighed so heavily on its commander, Captain James M. Longwell, that he resigned on November 21st and returned to Paw Paw. When the order was published in October that volunteers could join regular army units for the remainder of their enlistments, it is unsurprising that John, his cousin Art, and six others volunteered for what they expected to be easier duty in the regular cavalry. All eight were enlisted into the regiment by Captain Samuel Starr in Alexandria, Virginia on October 28, 1862. John’s enlistment documents describe him as 5’ 5” tall, with light hair, blue eyes and a light complexion. He listed his occupation as a farmer. John and two others, Henry Crandall and Samuel Garver, were assigned to Captain Starr’s Company D. Arthur and the others were assigned to Company B. All eight survived the heavy fighting of 1863, including the grueling Gettysburg campaign. John thought so much of service with the cavalry that he re-enlisted at Leonardstown, Maryland on March 25, 1864. The Michigan men all survived the intense fighting of the Overland campaign during the summer of 1864 more or less intact. Unfortunately, they did not fare as well in the Shenandoah Valley. Three days later John was evacuated to McClellan Hospital in Germantown, PA. He was forwarded with the remainder of the regular cavalry wounded to Carlisle Barracks about a month later. He was discharged for disability at Carlisle Barracks, Pennsylvania on December, a week after the other seven were discharged by order of the Adjutant General’s Office since their volunteer enlistments had expired. John returned to Paw Paw after his discharge. He filed his pension claim in January 1866. By 1870 he was working as a painter and married to his wife Rosetta, a woman seven years younger from New York. She died childless before the next census, and John never remarried. In 1880 he was working in a furniture store in Paw Paw and living in a boarding house. His mother died there in 1887. John entered the National Home for Disabled Volunteer Soldiers in Milwaukee, Wisconsin on July 21, 1896. At the time he was receiving $8 per month from a disability pension. He was discharged at his own request February 3, 1899 and moved to nearby River Falls. In 1908, his pension was increased by Congress to $30 per month. His cousin Art had passed away the year before at the Michigan Soldiers Home. By 1912 John had returned to live in Paw Paw. By 1920 John had moved to California. His brother and sister had both died in Paw Paw the year before, so there were few remaining ties to keep him in Michigan. His half-brother, B.W. Bonfoey, lived in Los Angeles. In the 1920 census he was living at 926 Wall Street in Los Angeles, with no occupation listed. John Sirrine died chronic myocarditis and arterio sclerosis on March 5, 1923 in Los Angeles, California. He is buried in Los Angeles National Cemetery, plot 44 16. Abrams, James E. Resident of Paw Paw, MI. Enlisted Company C, 70th New York Infantry May 14, 1861, at Paw Paw, Michigan as a private. Transferred to Company B, 2nd U.S. Cavalry October 28, 1862 by Captain Samuel Starr in Alexandria, VA. Discharged at the expiration of his term of service on October 28, 1864 as a private. Born Clarendon county, New York. Farmer. Crandall, Henry. Resident of Keeler, MI. Enlisted Company C, 70th New York Infantry May 14, 1861, at Paw Paw, MI as a private. Transferred to Company D, 2nd U.S. Cavalry October 28, 1862 by Captain Samuel Starr in Alexandria, VA. Discharged by order of the Adjutant General’s Office at Camp Russell, Virginia on December 6, 1864 as a private. Born Hillsdale county, MI. Farmer. Garver, Samuel. Resident of Lawton, MI. Enlisted Company C, 70th New York Infantry April 27, 1861, at Paw Paw, MI as a private. Wounded in action at Williamsburg, VA on May 5, 1862. Transferred to Company D, 2nd U.S. Cavalry October 28, 1862 by Captain Samuel Starr in Alexandria, VA. Discharged by order of the Adjutant General’s Office at Camp Russell, Virginia on December 6, 1864as a private. Born Seneca county, Ohio. Farmer. Reese, Henry. Resident of Porter, MI. Enlisted Company C, 70th New York Infantry April 30, 1861, at Paw Paw, MI as a private. Transferred to Company B, 2nd U.S. Cavalry October 28, 1862 by Captain Samuel Starr in Alexandria, VA. Discharged by order of the Adjutant General’s Office at Camp Russell, VA on December 7, 1864 as a private. Born Kalamazoo, MI. Farmer. Robinson, Lyman. Resident of Paw Paw, MI. Enlisted Company C, 70th New York Infantry April 22, 1861, at Paw Paw, MI as a private. Transferred to Company B, 2nd U.S. Cavalry October 28, 1862 by Captain Samuel Starr in Alexandria, VA. Discharged by order of the Adjutant General’s Office at Camp Russell, VA on December 6, 1864 as a private. Born Van Buren county, MI. Cooper. Ryan, Michael. Resident of Lawrence, MI. Enlisted Company C, 70th New York Infantry May 22, 1861, at Paw Paw, MI as a sergeant. Transferred to Company B, 2nd U.S. Cavalry October 28, 1862 by Captain Samuel Starr in Alexandria, VA. Discharged by order of the Adjutant General’s Office on December 6, 1864 as a private. Re-entered service in Company B, 10th Michigan Cavalry, discharged November 7, 1865. Born in Ireland. Wagon maker. Sirrine, Art. Resident of Paw Paw, MI. Enlisted Company C, 70th New York Infantry April 20, 1861, at Paw Paw, MI as a private. Transferred to Company B, 2nd U.S. Cavalry October 28, 1862 by Captain Samuel Starr in Alexandria, VA. Discharged by order of the Adjutant General’s Office at Camp Russell, VA on December 6, 1864 as a private. Born Trumbull county, Ohio. Farmer. National Archives, Record Group 15, Records of the Veterans Administration, Pension record #67724. Rowland, Captain O.W. A History of Van Buren County Michigan, Volume 1. Chicago: The Lewis Publishing Company, 1912. Pages 300-307. Work sent me over to the San Luis Valley of Colorado a couple of months ago. Normally the valley isn’t much of a tourist destination, with the exception of land-locked natives in search of sand dunes and alligators. But it’s also the site of the first and second forts constructed in Colorado Territory, Fort Massachusetts and Fort Garland. While the former was quickly abandoned in the 1850s, the second figured slightly in the Civil War. This proved too long for a single post, so this one will focus on the fort’s Civil War history and I’ll do another on the fort itself. At the beginning of 1861, the fort was garrisoned by three companies of regulars: Companies A and F, 10th Infantry and Company G, 2nd Dragoons. The post was commanded by Captain Cuvier Grover of the 10th Infantry, and Lieutenant Ebenezar Gay commanded Company G. In February Company G was ordered to Taos, New Mexico, and in March to Fort Union. Major E.R.S. Canby, 10th Infantry, rejoined from an expedition into Navajo county in March, and resumed command of the post. Edward Richard Sprague Canby, a native of Kentucky, graduated from West Point in 1835. He served in the 2nd U.S. Infantry until 1855, when he was promoted to major in the 10th Infantry. During the Mexican War, he earned brevet promotions to major at Churubusco and Contreras and to lieutenant colonel at Belen Gate, Mexico City for gallantry in action. Major Canby was ordered south to Fort Union in May, and Major Daniel P. Whiting, also of the 10th Infantry, arrived June 15th to assume command of the two infantry companies and the post. David Powers Whiting graduated from the United States Military Academy in 1828, 28th in his class. He served in the 7th U.S. Infantry as a lieutenant and captain, and earned a brevet promotion to major during the Mexican War for gallant and meritorious conduct during the battle of Cerro Gordo. He was promoted to major in the 10th Infantry on December 20, 1860, and was a year senior to Canby. Company F, 10th Infantry was ordered to Fort Union July 9th, leaving the understrength Company A to garrison the fort. First Lieutenant William H. Russell commanded the 22 enlisted men present for duty, as well as serving as the post’s acting assistant quartermaster and acting assistant of commisary services. Company I, 2nd U.S. Cavalry arrived at the post on October 9th. Captain T.J. Durnin of the 16th Infantry commanded the 30 enlisted men of the company present for duty. Thomas James Durnin enlisted in Company G, 2nd U.S. Dragoons on June 14, 1855. He was promoted to corporal, sergeant and first sergeant in the company by the war’s outbreak. He was appointed a second lieutenant in the 16th Infantry in the orders expanding the regular army on May 14, 1861. Interestingly, though identified as a captain in numerous post returns, he was not promoted to first lieutenant until October, and was not actually a captain until December 1864. The garrison remained unchanged for Major Whiting until December, which was a busy month for the post. Company A, 10th Infantry departed on the 10th for Santa Fe. Captain Theodore H. Dodd’s company of Colorado volunteers arrived on the 14th, followed seven days later by Captain James H. Ford’s company of Colorado volunteers. Garrison changes continued through the early months of 1862. Dodd’s Company stayed only long enough to recover from its long march and reprovision, departing January 3rd for Santa Fe. Ford’s Company left a month later, on February 5th. Company I, 2nd U.S. Cavalry, still commanded by Captain Durnin, was the post’s only garrison through spring and early summer. In March 1862 the post was finally assigned medical staff. Civilian Lewis B. McLain was assigned as the acting assistant surgeon by the district’s medical director in Santa Fe. July 1862 was another month of great change for the small fort. Major A.H. Mayer, 1st New Mexico Volunteers, arrived to take command of the post on July 17th. Daniel Whiting, now a lieutenant colonel in the 10th U.S. Infantry, departed to join his regiment on the 26th. He was the last regular army officer to command the post for several years. Company I, 2nd U.S. Cavalry was joined in garrison by Company D, 1st New Mexico Volunteers on July 30th. Company I and Captain Durnin departed the post for Fort Union on August 9th, replaced two weeks later by Company H, 2nd Colorado Volunteers on August 24th. Company H and Company D, 1st New Mexico Volunteers departed on a ten day scout September 5th, marching 242 miles before returning to post on the 15th. They were joined by four additional companies the following month, raising the garrison to its largest size during the war. Company C, 3rd U.S. Cavalry arrived from Fort Union on September 24th, followed three days later by Company M, 1st New Mexico Volunteers. Companies H and K, 1st Colorado Volunteers, arrived under Major Edward W. Wynkoop on September 29th, bringing the garrison to 370 enlisted men by the end of the month. With only two company-sized barracks buildings, many of the men must have lived under canvas. The garrison thinned considerably in October. Company C, 3rd U.S. Cavalry departed for Fort Lyon on the 3rd. Major Wynkoop left for Denver with Companies H and K, 1st Colorado Cavalry on the 26th, accompanied by Company H, 2nd Colorado Cavalry. Company D, 1st New Mexico Volunteers remained the sole garrison for the next few months, though the post commander changed several times. Major Mayer left the post on December 10th, ostensibly on 60 days leave, but he never returned. Captain Ethan W. Eaton of Company D, 1st New Mexico assumed command. The remainder of the winter was quiet, broken only by an expedition of 2 officers and 28 enlisted men to Conejos ordered by the Department of New Mexico in February. Captain Eaton established the garrison at Conejos under Lieutenant Moore and returned to the post. April was evidently a confusing month for the post. Post returns at the time were filed every ten days instead of the usual monthly requirement. Early in the month, Captain Joseph B. Davidson and Company C, 1st Colorado Cavalry arrived at the post. Captain Davidson assumed command on the 16th, but on the 20th both he and Captain Eaton filed post returns stating they were in command. Closer examination revealed that Captain Eaton had been absent without leave until April 18th, and had apparently been submitting returns in absentia. When this started is unclear, but the May return shows that Captain Eaton was dismissed from the service by War Department Special Order 63, April 9, 1863. Captain Davidson remained in command of the post, and Captain Birney arrived to take command of Company D on May 30th. There was also a murder on the post in May. According to the post return, “Private Lujan of Co. D 1st New Mexico Vol was Shot by Private Cambojar while asleep in his quarters.” It is unclear what the outcome of this event was, but the company was relieved from duty at the post the next month, departing under Captain Birney for regimental headquarters on June 6th. Company E, 1st Colorado Cavalry arrived on July 12th, bringing the present for duty strength of the garrison to 52 enlisted men. August 1863 was a very active month for the post. Reporting requirements changed, with orders now coming to the post from the District of Colorado rather than the Department of New Mexico. Lieutenant Colonel Samuel Tappan of the 1st Colorado Volunteers arrived to take command of the post on August 12th. Colorado also sent additional forces to garrison the fort. The 45 enlisted men of Company F, 3rd Colorado Volunteers under 2nd Lieutenant Albert S. Gooding arrived from Denver on the 21st, and the 26 enlisted men of the Right Section, 1st Colorado Battery under 2nd Lieutenant Horace W. Baldwin arrived five days later. Lieutenant S.N. Crane of the 1st Colorado Cavalry and 30 men relieved 1st Lieutenant Moore’s garrison at Conejos, and he returned to the post and assumed command of the squadron on the 16th. At the end of September, Governor John Lewis and Colonel Chivington briefly visited the fort while sending troops into the field against the Indians. Although there had been no issues near the fort, an expedition departed on the 29th. Lieutenant Colonel Tappan commanded a battalion consisting of Companies C and E, 1st Colorado Cavalry and the Right Section, 1st Colorado Battery. 2nd Lieutenant Gooding served as the battalion adjutant, and 1st Lieutenant David R. Wright assumed command of Company F, 3rd Colorado Volunteers and the post. Tappan, Company E and the artillery section returned on October 10th, followed by Company C the next day. Company C was ordered to Denver on the 17th, and Company F of the 3rd Colorado was relieved and ordered to Fort Lyon on the 28th. There was apparently some difficulty with the artillery section during the expedition, as 2nd Lieutenant Baldwin was dismissed from the service at the end of the month. Company E was reinforced by Company A, 1st Colorado Cavalry under Lieutenant Edward A. Jacobs on November 9th, bringing the squadron strength to 60 enlisted men. The Right Section, 1st Colorado Battery was commanded by a noncommissioned officer, and had only 10 enlisted men present for duty and no serviceable horses. This likely had something to do with Lt. Baldwin’s dismissal. On the 24th Lieutenant Moore and 40 men were dispatched to assist a supply train reach the post, most likely over La Veta pass. The winter of 1863-1864 was a quiet one for Lieutenant Colonel Tappan and the small garrison. In February, Lieutenant Baldwin returned to the artillery section, and in March the section changed from the right section to the left section. This appears to have simply been a change of designation, as no new troops arrived and Lt. Baldwin remained in charge of the section. The section departed for Camp Fillmore, Colorado Territory on April 16th. On June 1st, Captain Charles Kerber’s Company I, 1st Colorado Cavalry relieved Companies A and E as the post garrison. With a strength of only 2 officers and 33 enlisted men, there was plenty of room for the newcomers. Captain Isaac Gray and Company E departed the same day for Spring Bottom on the Arkansas River, followed on the 14th by Lieutenant Jacobs and Company A. Captain Kerber assumed command of the post from Lieutenant Colonel Tappan on June 19th. Despite the increasing hostilities with Indians elsewhere in the state that culminated in the Sand Creek Massacre in November, the remainder of 1864 was very quiet for the post’s small garrison. The company’s strength waned in the final months of the year. On November 1st, civilian F.R. Waggoner assumed duties as the post’s acting assistant surgeon, relieving Lewis McLain, the post longest tenured wartime resident. By December, the 37 enlisted men present for duty were nearly outnumbered by the post’s 24 civilian employees – a quartermaster clerk, a commissary clerk, two storekeepers, a wagon master, a saddler, a chief herder, two herders, , a cook, a butcher, eight teamsters and six laborers. 1865 was uneventful for the post. Captain Kerber remained in command of the fort through the end of the war. In February, Company I was designated as “Squadron B, Veteran Battalion, 1st Colorado Cavalry.” Although the garrison’s strength had increased to 72 men present for duty by April, no new units arrived at the fort. The wartime regular army commanders of Fort Garland did not fare well after the war. Canby, promoted to general in the interim, was killed by Modoc Indians during a peace conference in California in 1873. David P. Whiting retired before the war ended, on November 4, 1863. Thomas J. Durnin was transferred to the 25th Infantry Regiment as part of an expansion of the regular army on September 21, 1866. He was cashiered exactly one year from that date. The following post will examine the post itself, and the efforts of a dedicated few to preserve it for future generations. At the beginning of May 1863, the 2d U.S. Cavalry’s regimental strength with the Army of the Potomac was 17 officers and 304 enlisted men in ten companies. Although authorized twelve companies, Company M was not yet mustered and Company C had just reached Washington from the western theater. The regiment was commanded in May by Major Charles J. Whiting, the only field grade officer present for duty with his regiment of the four regular cavalry regiments in the Army of the Potomac. All ten companies with the army participated in Stoneman’s Raid, apparently with a steep bill in horseflesh. The monthly return shows 165 unserviceable horses in the regiment. Expiration of enlistments was fast becoming a problem as well, with 32 veterans departing the regiment this month. Average company strength was only 30. Not a single company had its full complement of officers. Of the ten companies, three were commanded by captains, four by first lieutenants and three by second lieutenants. All three of the second lieutenants were former first sergeants. Source: NARA, Returns of Regular Army Regiments, 2d U.S. Cavalry, April 1863, images 223-224. Henry Sachs was born in Bavaria about 1836. He immigrated to the United States at age 16, aboard the ship Emperor from LeHavre, France. He arrived in New York City on September 27, 1852. Five years late, Sachs lived in Boston and worked as a laborer. He was enlisted into Company K, 2d Dragoons there by Lt. McArthur on October 1, 1857. His enlistment documents describe him as 5’9” tall, with hazel eyes, dark hair, and a fair complexion. Sachs served in the regiment on the frontier and in Utah until the outbreak of the war, earning promotions to corporal and sergeant in Co. K. His was the only company of the regiment to reach Washington, D.C. in time for the battle of Bull Run in July 1862, where he distinguished himself. According to Colonel Porter’s report on the battle, “While the cavalry were engaged in feeling the left flank of the enemy’s position, some important captures were made — one by Sergeant sachs, Second Dragoons, of a General George H. Steuart, of Baltimore.” This exploit earned him a promotion to first sergeant of the company, and later a second promotion. On October 24, 1861, First Sergeant Sachs was discharged in Washington, D.C. to receive a commission as a second lieutenant assigned to Company C, 3rd U.S. Cavalry. The regiment was then fighting in New Mexico Territory. He started west not long after, but took a long time to reach his new regiment. By the following June, Lt. Sachs had only reached Fort Leavenworth, Kansas Territory, where the post commander assigned him as the post adjutant. Sachs was promoted to first lieutenant, 3rd Cavalry and assigned to Company L on July 17, 1862, but remained at Fort Leavenworth for the next nine months working as the post adjutant and acting assistant quartermaster. While at the post, he participated in skirmishes at Rocky Bluff and Hickory Grove, Missouri in August 1862. He was wounded in a separate skirmish with Quantrill’s raiders in Missouri the following month. After he joined his regiment, Lt. Sachs commanded a detachment in Tennessee in June 1863 for several months. On October 15, he was assigned as the Regimental Quartermaster and served in that position until June 1, 1864. After his relief from this position, he commanded an independent company of cavalry near Van Buren, Arkansas for several months. Something that he did during this time brought him to the attention of his superiors, for on November 7, 1864, Lt. Sachs was assigned to headquarters, Department of Arkansas, on the staff of Maj.Gen. Frederick Steele. He served the next two months as an acting assistant quartermaster for the department. 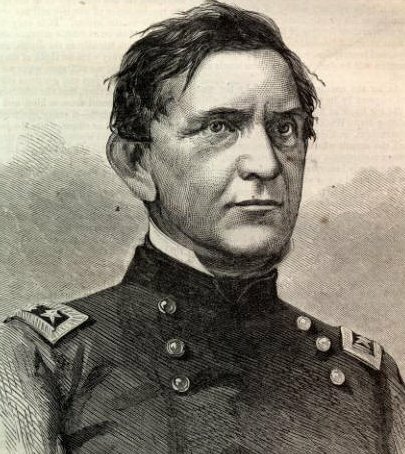 First Lieutenant Sachs resigned his commission on January 25, 1865 for unknown reasons, and I was unable to find any further record of him following the war. Will the Real George H. Steuart Please Stand Up? While compiling the list of Civil War officers of the 3rd U.S. Cavalry (see previous post), one of the names on the list caught my eye, Henry Sachs. I knew I had seen the name somewhere, and knew it was from the 2nd U.S. Cavalry during the war, but couldn’t remember exactly where. At first I thought he was the sergeant featured in the Don Stivers print “Medal of Honor,” where the first sergeant of Company K, 2nd U.S. cavalry saved his company commander, the badly wounded Theophilus Rodenbough at the battle of Winchester on September 19, 1864. As it turns out, I had the right company, but the wrong guy. Company K of the 2nd U.S. Dragoons (later 2nd U.S. Cavalry)was the only company present at First Bull Run, part of the battalion of regular cavalry under the command of Innis Palmer. One of the sergeants of Co. K, Henry Sachs, is credited with the capture of “General George H. Steuart, of Baltimore” in Colonel Porter’s official report of the battle. In regimental histories of the battle, it is noted that General Steuart had formerly served as a lieutenant in the regiment, and in one account I saw that Sachs captured his former commander. This is not the case. After a good bit of digging for research and a check with Harry Smeltzer, whose blog Bull Runnings is the premier online resource for the battle, I have determined that while Col. Porter’s report is correct, the account in Joseph I. Lambert’s One Hundred Years With the Second Cavalry is not. Rodenbough’s From Everglade to Canyon simply quotes Porter’s report. There were two George H. Steuarts at First Bull Run, father and son, both from Baltimore. George the Elder, born November 1, 1790 and captured on the battlefield, was a veteran of the War of 1812 and promoted to brigadier general of the Maryland militia in 1833. 71 at the time of the battle, he was not actually a serving officer in the Confederate Army, and was subsequently released. It is not known what he was doing on the battlefield, but there were numerous spectators from both sides at the battle. It has been postulated that he was looking for his son, but I have not been able to corroborate this. 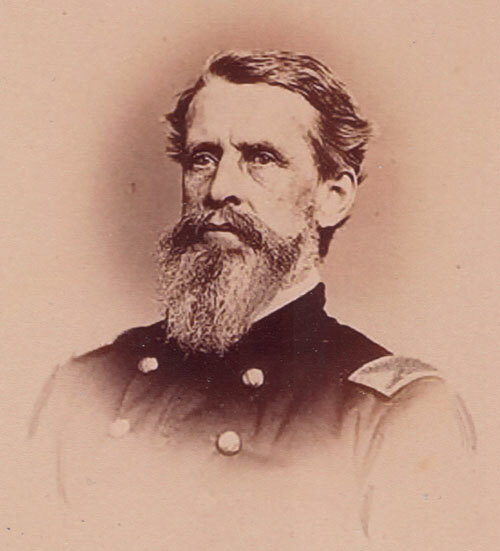 George H. Steuart, Jr. graduated West Point 37th in the class of 1848, serving as a lieutenant in the 2nd Dragoons after he graduated. He was promoted to 1st Lieutenant, 1st U.S. Cavalry on March 3, 1855. He resigned his commission on April 22, 1861. He initially received an appointment as a captain of cavalry in the Confederate regular army, but subsequently received an appointment as the lieutenant colonel of the 1st Maryland (CSA) Infantry. This was the position he held during the battle. He was promoted to Brigadier General in March 1862 and served through the war, though he too was captured — with his division commander at the battle of Spotsylvania Court House. Later exchanged, he was present with General Lee at Appomattox, and returned to Baltimore after the war. So it was the father, not the cavalryman, who was captured at First Bull Run. He and Sachs never served together, as Sachs didn’t enlist in the regiment until 1857, two years after Steuart moved on to the 1st U.S. Cavalry. As for Henry Sachs, more about him tomorrow. Friend Larry Freiheit emailed me recently with a query about the regular cavalry in the Maryland Campaign. It’s not a campaign that the regular cavalry was particularly active or effective in, so the little available information is somewhat obscure. In examining the 2nd Cavalry in particular, the question of regimental and company strength is confusing at best, and baffling at worst. The regiment began the campaign with only four companies: E, F, H and K, and a small headquarters staff. Co.’s A, B and D were broken up in July 1862, with their privates sent to other companies and the sergeants, buglers and officers sent to recruit in New York City, Carlisle barracks and Morristown, PA, respectively. Co.’s C, G and I were still in the western theater, on their respective journeys to rejoin the regiment from the beginning of the war. L and M Companies had only been authorized a month or so before and had just started recruiting. By year’s end 11 of 12 companies would be present on the Rappahannock, but for this campaign there were only four. The regiment was commanded by the senior company commander present for duty. His staff consisted of permanently assigned positions. For this campaign they consisted of regimental adjutant, 2nd Lt. James McQuesten, the regimental sergeant major, Sgt. Maj. Robert Lennox, and the regimental quartermaster sergeant, Sgt. Edward J. Spaulding. The regiment disembarked ships from the Peninsula on August 25th, and went into camp in Centerville, VA. On September 1st, it was assigned as the Provost Guard for the General Headquarters, Army of the Potomac. Parts of the regiment, as well as a squadron from the 4th U.S. Cavalry, had performed similar duties during the preceding campaign. The present for duty strengths of the four companies from the end of September 1862 monthly return are listed below. Bear in mind that the authorized strength of a cavalry company at this time was roughly 100 men, with a captain, first lieutenant and second lieutenant each. These officer numbers are a little tricky, however, as a number of noncommissioned officers of the regiment were approved for appointments as second lieutenants on July 17th. This news unfortunately did not reach the regiment until after the battle on September 24th. These promotions distort the already understrength numbers above. The promotions affecting the companies of the Maryland portion of the regiment are below. Regimental present for duty strength for the battle of Antietam for Captain George A. Gordon’s 2nd U.S. Cavalry was 4 officers and 117 enlisted men, just over one company in strength. I thought I had posted this entry several days ago, so I suppose posting it today is somewhat of a lame birthday present for Brian Downey of Behind Antietam on the Web as well. Happy Birthday Brian! I recently received a request to check into David Stuart Gordon, and unearthed a very interesting cavalryman’s career. David Stuart Gordon was born in Franklin, Pennsylvania on May 23, 1832, four years to the day before the birth of the regiment in which he would spend the majority of his career. Prior to the war, he moved to Leavenworth, Kansas, where he worked as a merchant and the city auditor. After Lincoln was elected president, Senator James H. Lane of Kansas offered him a bodyguard of men from Kansas to protect him during his trip to Washington. Lincoln declined the offer, but Lane sent the men to Washington anyway. They organized themselves as a company known as the “Frontier Guard,” and established their headquarters at the Willard Hotel. Senator Lane was the company’s captain, and David S. Gordon was its first sergeant. Four days after the surrender of Fort Sumter, the company was asked by the Secretary of War to secure the White House. The company remained on duty there for several weeks before they were honorably discharged. It is not surprising, then, that Gordon was in the first round of civilian appointments of officers to replace resignations in the regular army’s regiments. Senator Lane likely had something to do with this, since he was appointed to the Army from Kansas and not his native Pennsylvania. He was appointed second lieutenant in the 2nd U.S. Cavalry on April 26, 1861, and accepted the appointment the next day. Companies from the regiment were at that time arriving at Carlisle Barracks, PA from their evacuation of Texas. As soon as the first companies were refitted, they were dispatched to Washington, D.C. to defend the capitol. Gordon joined them when they reached Washington. He does not appear on the regiment’s muster rolls in April, May or June 1861. On May 31, 1861, he accompanied Lt. Charles Tompkins and his company on a raid to Fairfax Courthouse (see here for details). Following the raid, and probably as a result of the hubbub surrounding it, Lt. Gordon was appointed an aide de camp to General Keyes. He was captured while serving in this position on July 21, 1861, during the battle of Bull Run. Gordon was quite well-travelled as a prisoner, as the Confederate government struggled to establish a system for handling prisoners of war. Initially sent to Libby Prison in Richmond, he was subsequently incarcerated at Castle Pinckney, Charleston, SC; Columbia jail, SC; and Salisbury, NC. He was not exchanged until August 1862. In the meantime, the U.S. cavalry regiments were redesignated the month after Bull Run. The 2nd Cavalry became the 5th Cavalry, and the 2nd Dragoons became the 2nd Cavalry. So Gordon emerged from captivity to service in a new regiment of the same name. Such was the confusion over which regiment Gordon was assigned to that he appears in George Price’s Across the Continent With the Fifth Cavalry only in Charles Tompkins’ entry. He served for several months as the inspector of the U.S. Army’s Parole Camp at Annapolis, MD before joining the regiment just before the battle of Fredericksburg. 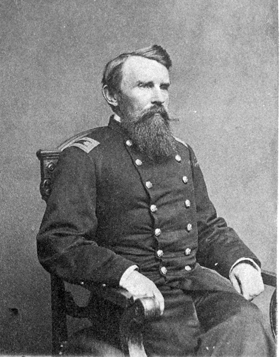 Following the battle of Fredericksburg, Lt. Gordon was assigned to the staff of General Schenk, commander of the Middle Department at Baltimore, MD. He served as an acting assistant adjutant general to General Schenk through the Gettysburg campaign. On April 25, 1863, he was promoted to captain in the 2nd US Cavalry, and on paper assigned to Company D, though still listed on detached service. He received a brevet to major, U.S. Army for gallant and meritorious service at the battle of Gettysburg. He rejoined his regiment during the pursuit from Gettysburg, seeing action at Manassas Gap, Rappahannock Station, and Culpeper Courthouse. In 1864 he served with regiment during the Wilderness campaign and Sheridan’s two raids. He commanded the regiment on the second day of the battle of Trevillian Station when Capt. T.F. Rodenbough was seriously wounded on June 11. He commanded the regiment through the battle of Deep Bottom on July 27-28, 1864, and during the majority of the Shenandoah campaign from August to October 1864. In late October he was assigned to Carlisle Barracks for recruiting duty, as were officers from all the regular cavalry regiments. He was further assigned to Cincinnati, OH, where he recruited for his regiment from October 1864 to January 1865. His regiment did not participate in the Appomattox campaign, and as the senior officer present he assumed command when he rejoined it at Point of Rocks, MD from March to November 1865. At that point the majority of the brevetted officers returned from duty with volunteer regiments, and Gordon made the long slide down to once again commanding his Company D. The regiment was assigned to duty on the frontier In November, and began the long march to Fort Leavenworth, KS. Once the regiment reached Kansas, Gordon and Company D were further assigned to Fort Lyon, CO, where they remained until October 1866. The 2nd US Cavalry was reassigned to the Department of the Platte under pre-war commander Philip St. George Cooke at the end of the year, and the regiment’s companies were reassigned to forts in what is today Wyoming, South Dakota and Nebraska. Capt. Gordon and his company spent only a few weeks at their new post of Fort Laramie, Dakota Territory when they once again received marching orders. Following news of the Fetterman massacre, a column of infantry and cavalry was dispatched to the relief of Fort Kearney in January 1867. Gordon commanded a squadron of his own company and Company L in support of four companies of the 10th Infantry. An impromptu winter march across Nebraska must have been a challenging mission. Once they reached the fort, the majority of the column returned to Fort Laramie, but Gordon and his company garrisoned the fort until it was closed the following July. Gordon’s next post was Fort D.A. Russell, Wyoming Territory, where he and his company served from August 1868 to May 1869. During this period his service is described as “engaged with hostile Indians and escorting mail and government trains.” Gordon later published an account of this expedition in the Journal of the Military Service Institution of the United States in 1911. Gordon’s company conducted an extended scouting expedition of the Wind River valley from May to September 1869, engaged multiple times with hostile Indians before moving to Fort Bridger, Wyoming Territory in October. They were engaged in the affair at Miner’s Delight, WT on May 4, 1870, but I could not locate any information on said affair. They were then assigned to Camp Douglass, WT, where they spent the next five years. At this point Gordon’s career becomes very cloudy. He was steadily promoted, so it’s unlikely any seriously untoward happened at Miner’s Delight, but there is no mention of further postings. He was promoted in the regiment to major on June 25, 1877 and lieutenant colonel on November 20, 1889. In 1892, he was assigned to command Fort Myer, Washington, D.C. He finally left his regiment on July 28, 1896, when he was promoted to colonel and command of the 6th U.S. Cavalry. Gordon was promoted to brigadier general upon his retirement on May 23, 1896. Brigadier General David S. Gordon died on January 30, 1930, and is buried in Arlington National Cemetery. Gordon, David S. “The Relief of Fort Phil Kearny,” Journal of the Military Service Institution of the United States, Volume 49, September-October 1911, pages 280-284. Lambert, Joseph. One Hundred Years With the Second Cavalry. San Antonio: Newton Publishing Company, 1999. New York Times articles, December 29, 1895 and January 28, 1912. Price, George F. Across the Continent with the Fifth Cavalry. New York: Antiquarian Press, Ltd, 1935. Speer, John. The Life of General James H. Lane. Will the Real John Dolan Please Stand Up? One of the joys of studying history is chasing down odd threads to see where they lead. I recently came across one such thread as I was cross-referencing information between regiments. I chanced upon an account of a former noncommissioned officer in George Price’s Across the Continent With the Fifth Cavalry that touched on three different regular cavalry regiments. Price’s account is the only more or less contemporary account of the regiment during the Civil war and on the frontier. It’s a decent reference as long as one keeps in mind that it has a very friendly bias (he was one of the regiment’s officers) and is entirely anecdotal in nature. A perfect soldier to profile, I thought. Given the information laid out by Price, there should be a wealth of information available on this fine soldier. Alas, trying to corroborate Price’s information in some areas proved to be quite challenging. A quick check of the National Park Service’s database revealed no less than ten John Dolans in regular cavalry regiments during the Civil War, from 5 of the 6 regular cavalry regiments. Two were for a first sergeant of Company B, 4th US Cavalry. The only records that I can find for a John Dolan in a mounted regiment through regimental muster rolls or enlistment documents prior to the Civil War are for the 2nd Dragoons, not the 1st Dragoons. According to his enlistment documents, Dolan was born in Longford, Ireland, and was described as 23 years old, 5’ 10” tall, with grey eyes, dark hair and a ruddy complexion. He was enlisted in Company B, 2nd Dragoons by Captain James Oakes in Pittsburgh on April 6, 1853. He reenlisted in the same company as a private at Fort Riley, Kansas Territory on February 6, 1857. 1st vs 2nd Dragoons is an easy enough mistake, so perhaps it was the same person. This is possible, but would have required Dolan to move between units a bit. In 1860, B Company, 2nd Dragoons, commanded by Captain John Buford, was in Utah on the Mormon Expedition, not fighting Indians. Transfers of soldiers and noncommissioned officers between companies within the regiment were not unheard of, however, if not an everyday occurrence. There were companies from the regiment in New Mexico and Colorado, and their movements east toward the war would have brought them into contact with the 4th Cavalry in Missouri at about the time of the battles mentioned. Indeed, the only regular cavalry representatives at the battle of Shiloh were Company C, 2nd Dragoons and Company I, 4th Cavalry, commanded by an infantry lieutenant. These two companies remained together through the fall of Corinth. At this point, our two Dolans diverge. 2nd Dragoon Dolan must have continued east with his regiment. He was in Carlisle, Pennsylvania when he was sworn in for his third enlistment, according to his enlistment papers, into Company M, 2nd Cavalry on May 28, 1862 as a private. During their long march west, the regiment had been redesignated as the 2nd Cavalry. His enlistment documents describe him as 32 years old, 5’ 11” tall, with grey eyes, dark hair and a ruddy complexion, matching our previous description. “He distinguished himself in the battles of Perryville and Stone River; commanded his company at Stone River, and had a horse killed under him during the pursuit of General Bragg; also had a horse killed under him and was severely wounded while commanding the advance-guard at the battle of Snow Hill,” according to Price. Entirely possible, as several first sergeants in the 4th Cavalry, many of them the same ones mentioned in the report from Stones River for gallantry while leading their companies, received commissions as second lieutenants in the regiment. Given his wounds, it is entirely possible that he wasn’t able to pass the examination. Another 4th Cavalry first sergeant who was appointed a lieutenant in the 6th US Cavalry waited several months to report to his new regiment while his wounds healed. This describes the course of the remainder of the 4th US Cavalry’s campaigns during the war, and logically makes sense. Unfortunately, I could find no reference to a John Dolan from the 4th US Cavalry in any records from Andersonville, and there is a pretty significant existing database. There was a John Dolan from the 1st Massachusetts Cavalry, but he perished from diarrhea, and the only regular army John Dolan was from the 19th US Infantry. Meanwhile, Dragoon Private Dolan again reenlisted at Carlisle, PA on April 11, 1865. This time he enlisted in Company I, 2nd Cavalry. His enlistment documents describe him as 35 years old, 5’11” tall, with grey eyes, brown hair and a ruddy complexion. He reenlisted a final time at Fort D.A. Russell, Dakota Territory on April 11, 1868, into the same company. Other than his age, his description in the documents is unchanged. He was discharged as an orderly sergeant from the 2nd Cavalry at the same post on May 24, 1869 in General Order #26, Department of the Platte and disappears from any further records. All quite possible, and accurate descriptions of units and locations, but I was unable to locate any documents confirming the information. Where does this leave us? With not one but two John Dolans, each of whom served in regular cavalry regiments over 25 years, including the entire Civil War. Surely that’s worth a memory and a few minutes of your time? Price, George F. Across the Continent with the Fifth Cavalry. New York: Antiquarian Press Ltd., 1959. Page 682.